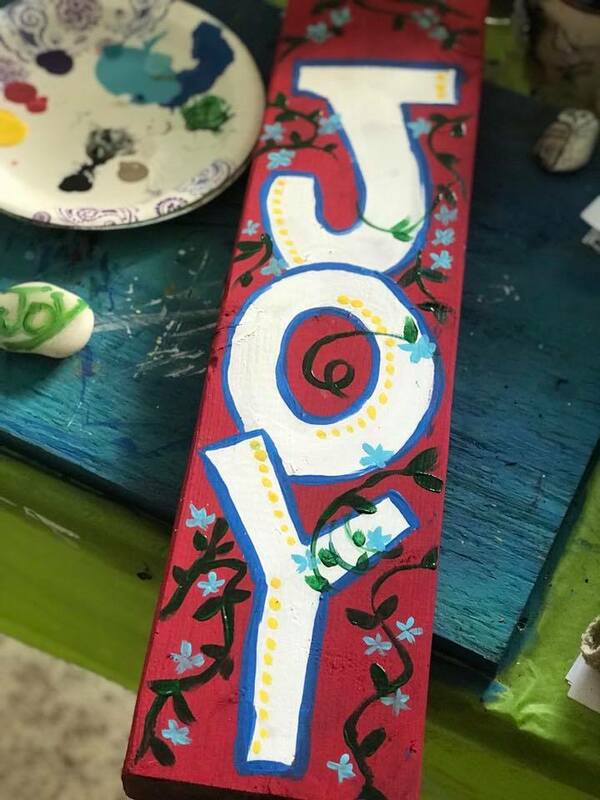 CREATE JOY all month long. Happy, happiest of New Year’s to you! around the world are going to CREATE JOY all month long. up a chair because you will be overflowing with ALL the ways you create joy in the art that is your life. WHAT YOU FOCUS ON GROWS.The challenge is: CREATE JOY every day this month.TODAY! January 1st Day #1 Prompt:Choose joy! Joy is my word for the year. It will strap rocket boosters to your resolution to create and experience more JOY in your life in 2019.How does it get any better than this! ?Well, it gets EVEN better because as you focus on JOY and raise your vibration (it has to happen) you also raise the vibration of our world. 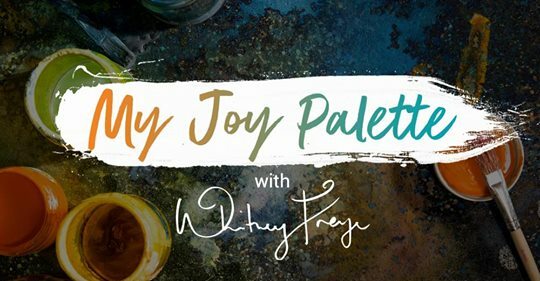 We are turning up the volume on the global JOY channel, so THAT is how it gets even better Go HERE to get more inspiration and guidance and to be a part of the JOY Palette movement all month long. Happy New Year–we are starting it in a totally new way to ensure that we each experience lots of NEWness in 2019! SO grateful to you for being here, reading these words, and creating MORE joy for us all! Blessings of love & laughter to you today. 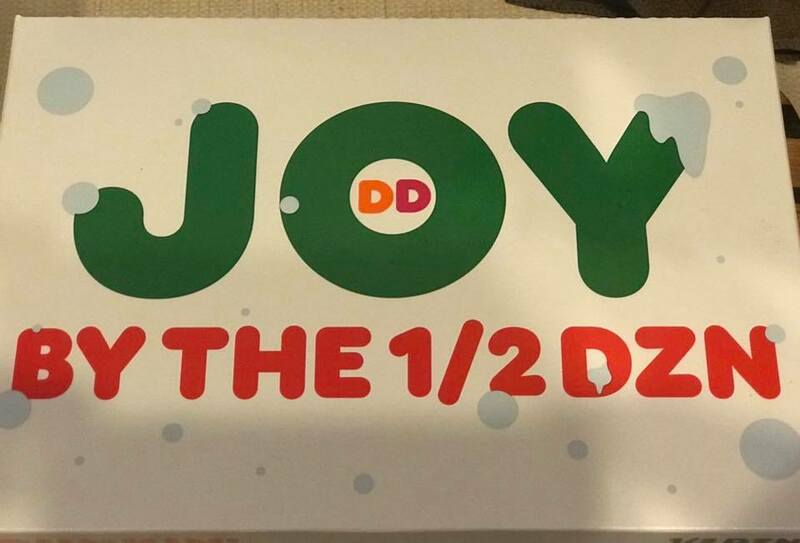 yummy donuts for my family to celebrate the New Year. I said yes to being interviewed and sharing our Yes Extravaganza with Ladies go live. what fun! and yes I was nervous but I said yes because I love to share and inspire others to live creatively. the article and video are below by Tina K Valant. 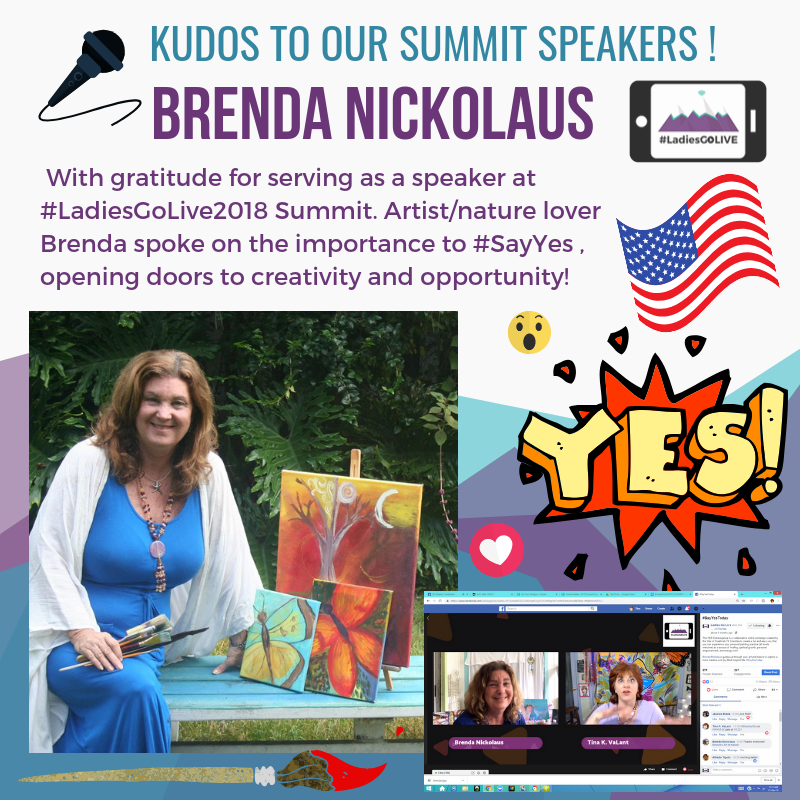 Artist, nature lover/educator Brenda Nickolaus inspires and coaxes creativity by connecting with nature. As a part of the #YesExtravaganza project, she encourages others by sharing her artistic flair and colorful ideas. Even if you don’t consider yourself creative, know that when you #SayYes, barriers and obstacles dissolve. #SayYesToday and unlock the doors to abundance and the opportunities awaiting you! 2:47 When people to create their own art and treat themselves kindly, magic happens. 10:12 Challenge yourself to #SayYes! 19:13 How saying yes increases positive energy. It’s the day before Christmas and If you are feeling anxious and/or overwhelmed, take a few minutes and step outside into Mother Nature. 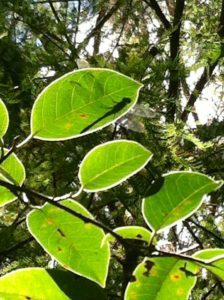 Here’s a little nature meditation for you…this is what I do when I feel overwhelmed, go on a walk in my backyard…listen to the pines singing in the wind. 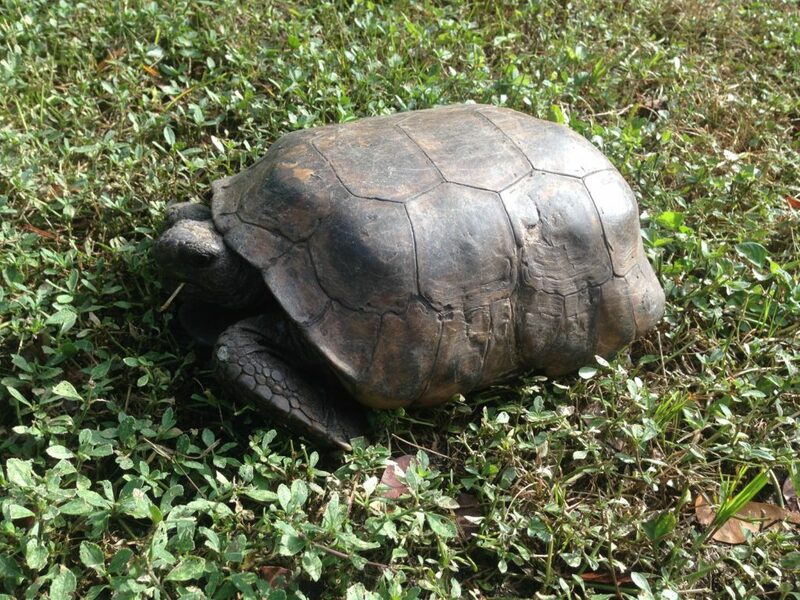 watch the butterflies flit about…or the front yard: count the bunnies and say hello to the gopher tortoise. Re focus and think about something you are grateful for. yes? a little joy for your day. Sending you many blessing and I’ll see you on the trail! I am Brenda Nickolaus from Art & Nature and today I’m here to give you some ideas and inspiration for encouraging the little artists in our lives. 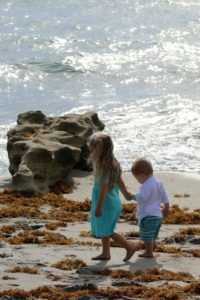 By Exploring nature creatively, it helps develop a child’s since of joy and wonder about the world around them. I love including natural objects in my craft box. It not only expands the creative experience but opens so many learning opportunities with your little ones. Humans have been creating and learning with natural objects for 1000′s of years. The planet is abundant with natural supplies – some are commonly found throughout the world, others unique to one specific area. When out collecting natural materials from your area, always remind your child how delicate the earth’s ecosystem is, and that you will only be collecting a limited amount, so that other creatures also have what they need. What kind of supplies should you collect? And remember to continue to explore nature throughout the seasons to observe the changes that have occurred and to discover new supplies that are found only during specific seasons. 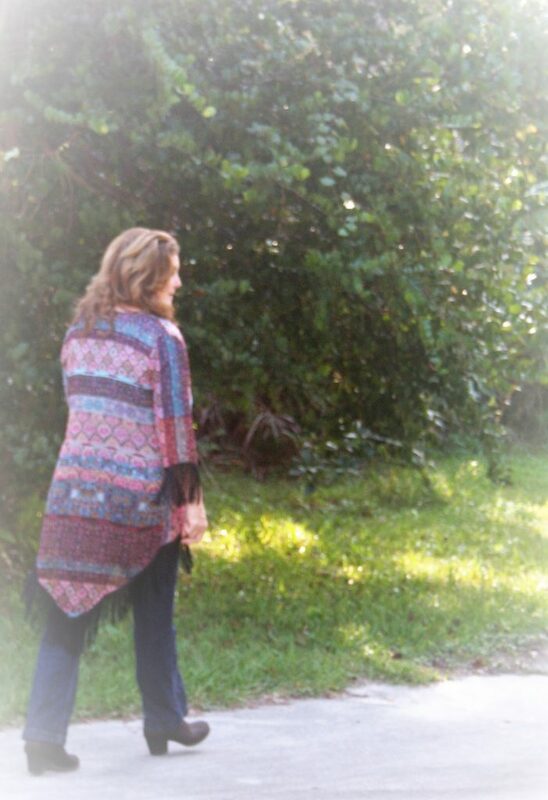 Living in south Florida it takes a good eye to observe the subtle changes in our seasons, but we do have them. Collecting fallen acorn caps and smaller pine cones and little acorn caps are a few nature finds we look forward to every Autumn! While out searching for your new supplies, ask your child simple questions to start a conversation. As you pick up each leaf, seedpod or shell remark on what the piece reminds you of. For example, a piece of driftwood may resemble the body of a duck, or a pine cone the body of an owl. This invokes the creative mind to see objects beyond simply what they are. 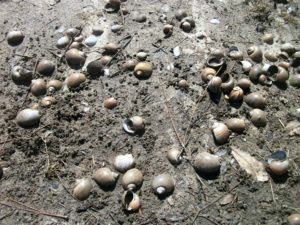 Or you may comment on how a certain shell reminds you of a storybook that you have read with your child or an interesting fact that you learned on a field trip together. Having the child recall the information about the book or experience stimulates the analytical mind and sparks curiosity. Remember to keep in mind your child’s personality and keep it fun! My son is very analytical he likes to line everything up by size, color…etc.-Where my daughter is more the playful throw it all together and see what happens. Create a photo that will celebrate your life. 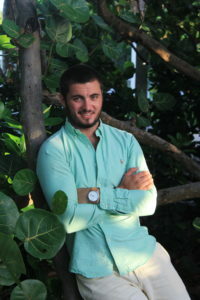 I am passionate about providing you with an incredible photography experience. I will help you feel comfortable and relaxed to create a portrait you will treasure. 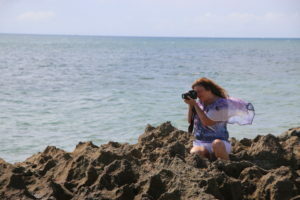 I am Brenda Nickolaus from Art in Nature and today I’m here to give you some ideas and inspiration for encouraging the little artists in our lives. By Exploring nature creatively it helps develop a child’s since of joy and wonder about the world around them. I love including natural objects in my craft basket of goodies. It’s not uncommon to find feathers and pretty shells in my art supplies… It not only expands the creative experience but opens up so many learning opportunities with your littles! Humans have been creating and learning with natural objects for 1000′s of years. The planet is abundant with natural supplies – some are commonly found throughout the world, others are unique to one specific area. And remember to continue to explore nature throughout the seasons to observe the changes that have occurred and to discover new supplies that are found only during specific seasons. Living in south Florida it takes a good eye to observe the subtle changes in our seasons but we do have them. Collecting fallen acorn caps and smaller pine cones are something that our family looks forward to every Autumn! While out searching for your new supplies, ask your child simple questions to start a conversation. As you pick up each leaf, seedpod or shell remark on what the piece reminds you of. For example a piece of driftwood may resemble the body of a duck, or a pine cone the body of an owl. This will invoke the creative mind to see objects beyond simply what they are. Now what to do with your new found treasures? I have found craft books to be filled with great ideas, techniques and inspiration to stimulate the artistic mind. Remember to keep in mind your child’s personality and keep it fun! My son is very analytical he liked to line everything up by size color…etc. (he still does) -Where my daughter is more the playful throw it all together and see what happens. What types of natural materials are available to craft and learn within your corner of the world? I’d love to hear and see some of your crafting ideas. Please share below. 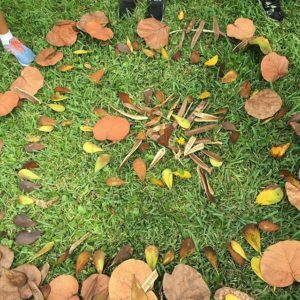 In our Art and Nature Explorer classes our projects often are inspired by the things we find in our environment. We have the best classroom right outside our front doors. 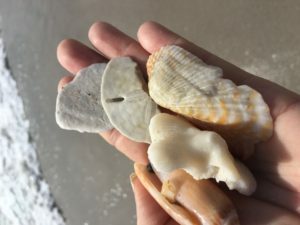 From seashells, sticks and stones to leaves! One of our days we made collages using giant leaves they collected on a walk. 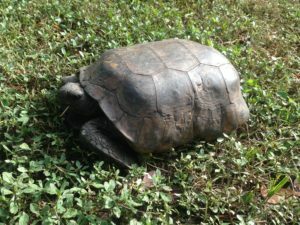 I love being able to take the Art and Nature Explorers on the road and visit different parks and enviromental areas. 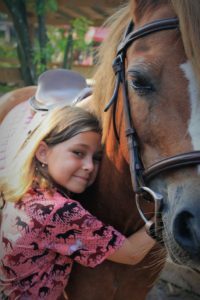 They learn about the envirioment how to take care of it and make that heart to heart connection to the world around them. 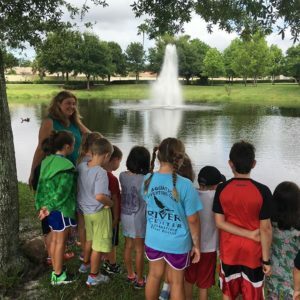 Exploring nature through creativity is a unique program to encourage a childs curiosity, explore and reconnect to the magic of nature that is around them. I do believe in no child left inside, what they learn to love they will protect. I could have a classroom but we do have the best classroom of all just right outside! 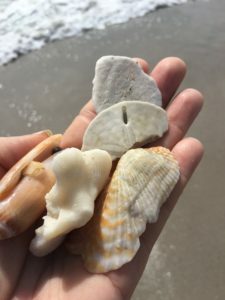 One of the great benefits of being able to travel to different locations like the beach, the pineland trails or the old oak hammocks is the ability for the children to be exposed to a variety of different environmental area art materials and animals that live there. 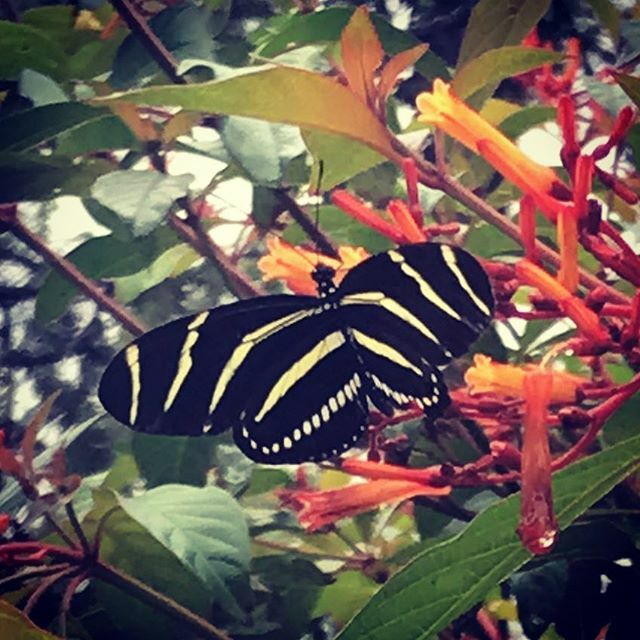 The art projects are about reconnecting to Mother Natures seasons and some of our projects are inspired by an animal we are lucky enough to find out on the trails. In our Art and Nature Explorer programs we incorporate a hands-on art activity. The lesson is from first inspiration to finished project art always involves nature. Sometimes even the leftovers of former environmental art projects can provide inspiration,. One group of children took vine circles left behind from another project creating beautiful dream catchers and wove with them, and made wreathes. They also brought the circles outside and used them to spark imaginary play including throwing objects through a target! 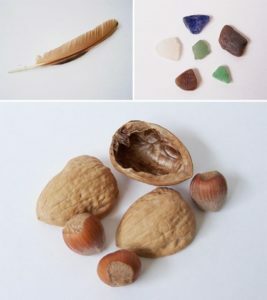 Fun use of imagination and natural materials for play! Children need art, not only for the development of their creativity, but as a support for growing cognitive, social, and motor abilities. Our art materials are thoughtfully arranged using wooden bowls or naturally colored containers. Natural materials such as grasses, seeds, leaves and sticks are placed next to the glue rather than the sequins or glitter you might find in a more traditional classroom. Being outside can bring its own way of dealing with obstacles: on one windy day the papers where flying! much to the glee of some of the children – others not so much, so we discovered the rocks could be used as a weight to help the papers stay in place. Using a simple lesson like this can help children discover their strengths and help them in other areas of life. sign up below for more information I’d love to see you out on the trails with us. chasing dragons…well drangonflies by the lake anyway! taking a moment talking to a dragonfly…. beautiful red color#animalmesenger. Do you see dragonfly? 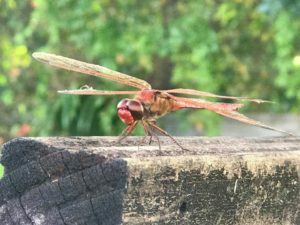 The dragonfly, in general, is symbolic for transformation and change. It is something that connects us with the spirits of nature and offers us joy. When you notice a dragonfly in your life you are being called upon to transform and evolve into a better version of yourself. This spirit animal is sent to inspire those who have it as a totem in order to bring about the changes they need in life. Are You Ready to Say YES!!! Are you ready to join the YES Extravaganza??? 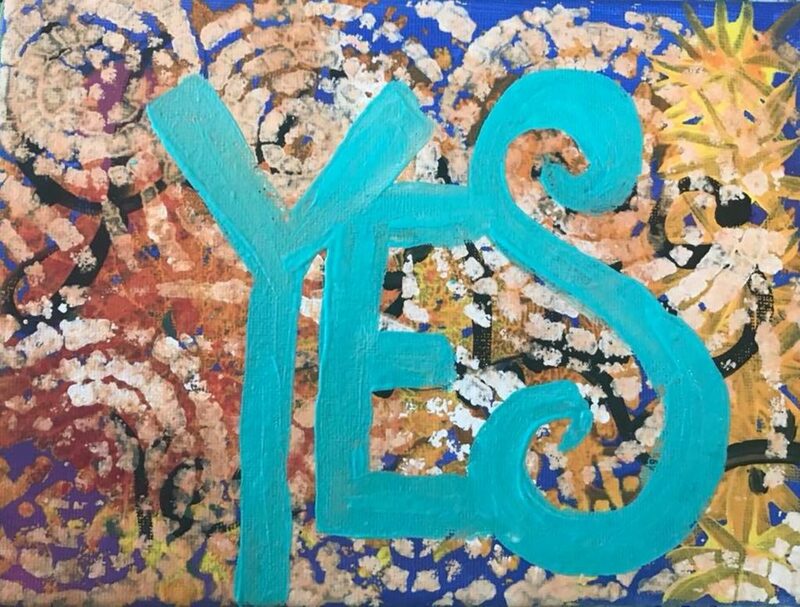 All of August, I’ve been painting the word YES and experiencing the results! Wow! It has been amazing to experience and witness the energy of optimism, belief, trust and hope that has resulted! Now, I get to share this experience with you! Yay! Go HERE http://bit.ly/BrendaYesExtravaganza to join the YES Extravaganza! 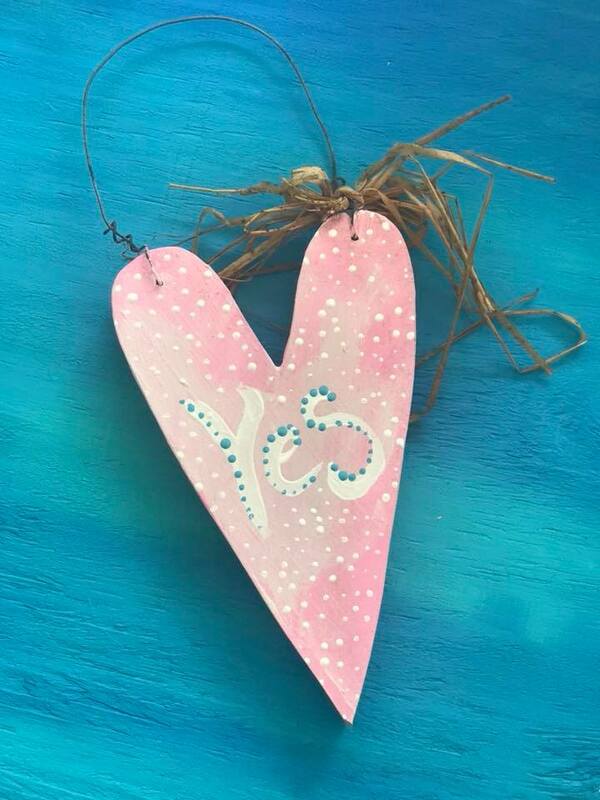 Here’s a fun and easy way to start your YES painting!! 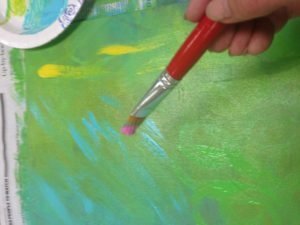 Use any acrylic paints that you have and just start painting what you are saying YES to! Paint the words of your dreams, your ideas, how you want to feel….or simply paint the word YES!!! Then, just add color, doodles, drips…cover the white canvas! 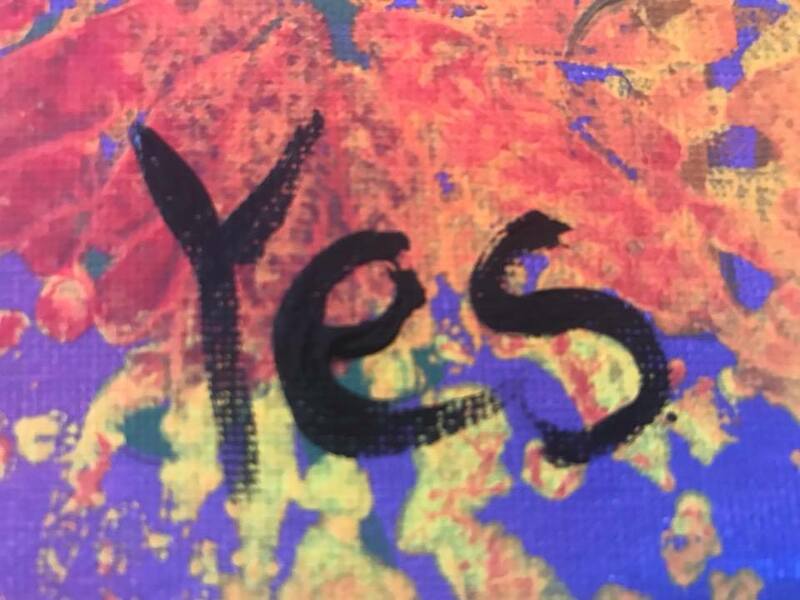 You can see in the image above the amazing power of painting the word YES!!! I said yes to receiving all the love and blessing of the universe. With every dot I tapped I counted my blessings. Very meditative and a great reminder to me everyday to count my blessings! …to believing that you CAN do it! Thank you for wanting to be a part of the YES Extravaganza! Share your progress with #YESextravaganza online so I can cheer you on! P.S. This is FREE and super fun! Simply go Go HERE http://bit.ly/BrendaYesExtravaganza to join the YES Extravaganza! to register & receive tips, instruction & community!